VOUT = VIN (the input) when the control signal is in the ON state. VOUT = RTN (ground) when the control signal is in the OFF state. The control signal is referenced to the RTN pin. POS - A CNTL voltage greater than Threshold + 1/2 Hysteresis turns on the VCVS and the output voltage equals the input voltage. NEG - A CNTL voltage less than Threshold - 1/2 Hysteresis turns on the VCVS and the output voltage equals the input voltage. Most users implement this function with two simple switches connected in a totem-pole configuration where VIN is the input voltage and VOUT is the output voltage. Because the SIMPLIS simple switches S1 and S2 have finite ON and OFF resistances, the totem-control configuration will always have numeric inaccuracies. These inaccuracies are caused by the inherent resistive divider network formed by the switch resistances. More importantly, the totem-pole switch implementation can slow down the simulation if a small capacitive load is applied to the output. This is due to the R-C time constant formed by the switch on resistance and the capacitive load. In contrast to the totem-pole switch circuit, this block was designed to eliminate the numeric inaccuracies caused by the voltage divider, and doesn't suffer from slow simulations with small capacitive loads. You should always use this block instead of a totem-pole switch configuration since this block is speed-optimized for SIMPLIS simulations and does not exhibit the numeric inaccuracy inherent to the totem-pole switch configuration. 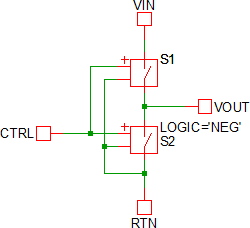 The following table describes the pins on the Switched VCVS symbol. 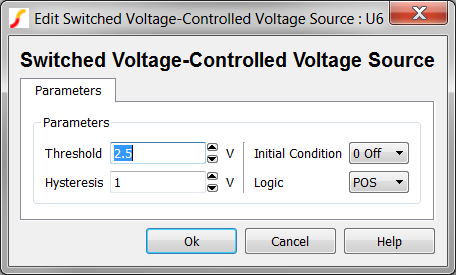 CNTL I On/Off control voltage The threshold voltage, hysteresis, and logic of the control voltage are set in the input dialog box described in Editing_the_Switched_VCVS. 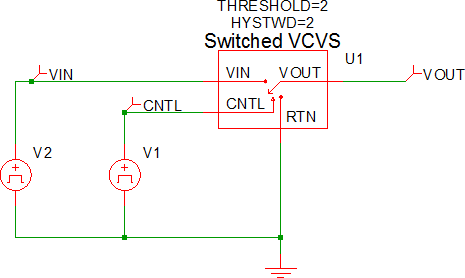 VOUT O Output Voltage for VCVS VOUT = VIN when the CNTL signal is in the ON state. 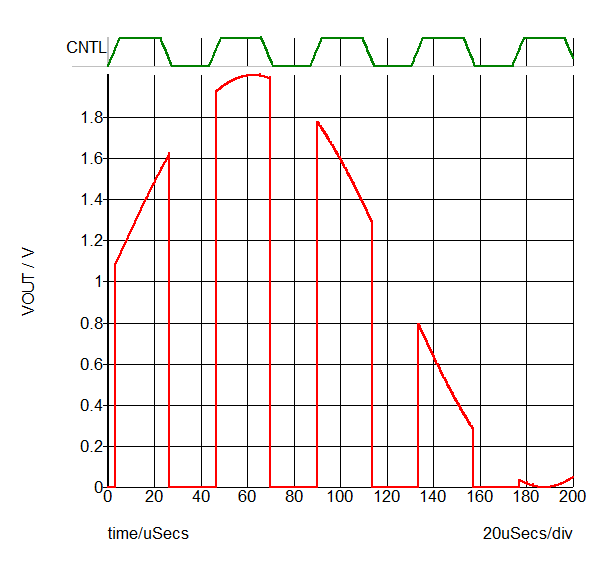 VOUT = 0 when the CNTL signal is in the OFF state. The initial condition can be set to either ON or OFF. Initial Condition Initial condition of the CNTL signal; default is 0 Off. Logic The logic of the CNTL signal, which can be set to positive or negative; default is POS. The test circuit used to generate the waveform examples in the next section can be downloaded here: simplis_071_switched_vcvs.sxsch. The waveform below is the test circuit showing a sinusoidal VIN waveform and an asynchronous CNTL waveform. The following waveform is for the test circuit with VIN hidden.